India have come out on top on the second day of the Vizag Test after Virat Kohli and Ravichandran Ashwin guided the hosts to a first-innings total of 455. Ashwin then scalped two wickets, while Shami and debutant Jayant Yadav had a wicket apiece leaving England struggling at 103/5 at stumps. After starting the second day on 317/4, Virat Kohli and Ravichandran Ashwin faced the England pacers with confidence displaying some beautiful drives in the first half hour. But the introduction of spin from Alastair Cook worked for the visitors with Virat Kohli being caught in the slip off Moeen Ali. Ravichandran Ashwin once again asserted his batting credentials today in the first session. After the early loss of Virat Kohli, Ashwin’s eighth Test half-century propelled India to a score of 455 runs in the first innings. The wicket didn’t offer anything for the pacers when the day started and that forced English skipper Alastair Cook to turn towards his crisis manager, Moeen Ali. Ali vindicated the decision by removing Virat Kohli for 167 runs. After the dismissal of the Indian skipper, Moeen got rid of wicket-keeper Wriddhiman Saha and Ravindra Jadeja within the space of only three deliveries. Despite Saha challenging umpire Kumar Dharmasena’s decision through DRS, it was the Sri Lankan who had the last laugh. Jadeja survived one ball as Moeen struck him plumb on the pads. After a long chat with his partner Ashwin, Jadeja decided not to go for the review but as luck would have it, replays suggested that the ball was actually sliding down the leg-side. Moeen’s early strike didn’t affect Ashwin as he frustrated the visitors with a 64-run stand with debutant Jayant Yadav. Ashwin was a little lucky though, as Ben Stokes missed his catch at slip when he was on 27. Despite Cook bringing on Joe Root just before the lunch, Ashwin showed sheer nonchalance to counter him, and the duo milked the bowling attack for some valuable runs before Stokes accounted for Ashwin's wicket when he was on 58. Umesh Yadav then scored a quick 13 runs before India were bundled out for 455 runs. England had a clear cut job on their hands - bat cautiously to counter the late turn in the afternoon session. But Mohammed Shami delivered an early blow by dismissing English skipper Alastair Cook with an absolute peach of a delivery that sneaked through the gap between his bat and pad to split his off stump into two. But after that, Root, also playing his 50th Test of his career, restored some order by defending solidly as the team went into the tea break at 34/1. But post the tea break, the Indian spinners exploited the turn on the pitch to their complete advantage. Within the space of 51 runs, England lost 4 wickets. It started with Jayant Yadav running out young Haseeb Hameed. The opener went for a run which Root initially showed interest in only to back out later, and Wriddhiman Saha pulled out a Dhoni-esque trick with a flick onto the stumps to run the teenager out. Ben Duckett did not stay long at the crease. Ashwin's delivery drifted between leg and off stump to go through the left-hander's defence to rattle the stumps. While Root completed his half-century, he too was unable to stop the collapse after he miscued Ashwin towards long-off only to be caught by Umesh Yadav in the deep with the score reading 79/4. 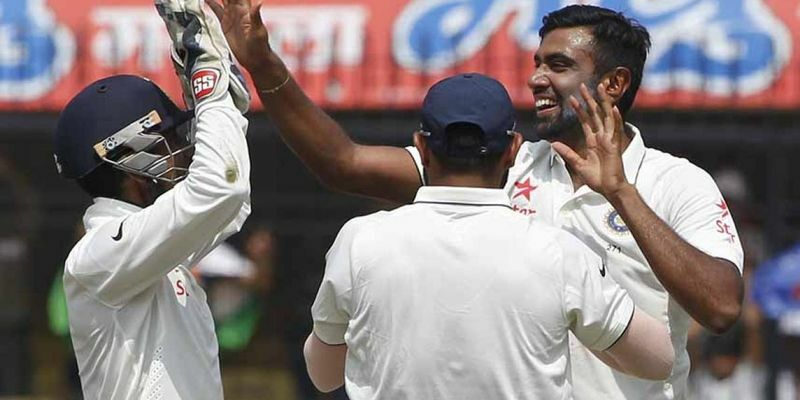 Debutant Jayant Yadav soon had his first Test wicket when he called for a review after the umpire deemed Moeen Ali not out for an lbw appeal. But reviews clearly showed that the impact was on the wicket, and Ali walked off with England in deep trouble at 80/5. Ben Stokes and Jonny Bairstow carefully navigated through the Indian spin to take the score to 103/5 by the end of the day. India will look to bring on the spinners early tomorrow and restrict England to a paltry score.